On July 26, 1990, President George H. W. Bush signed into law the Americans with Disabilities Act (“ADA”), prohibiting discrimination against people with disabilities (in 2008 the law was further bolstered by added amendments). What does the ADA mean for challenge courses and their employment practices? To be protected by Title I of the ADA, a person must not only be an individual with a disability, but a qualified individual. An employer is not required to hire or retain an individual who is not qualified to perform the job. According to the regulations, a qualified individual with a disability is someone with a disability who satisfies the requisite work, experience, education and other job related requirements of the employment position, and who, with or without reasonable accommodation can perform the essential functions of the position. For example, in determining whether an accountant with significant vision loss is qualified for a position as a certified public accountant (CPA) the first step is to determine if the accountant is a licensed CPA. If not, the accountant is not qualified. This is referred to as determining if an individual with a disability is “otherwise qualified”. The second step requires an employer to focus on the essential functions of the job. Many people with disabilities can perform essential functions of the job but are denied employment because they cannot do things that are only marginal to the job. 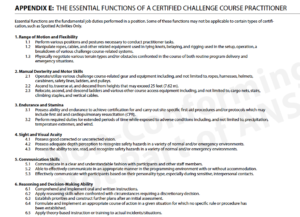 The Essential Functions of a Challenge Course Practitioner, from the ANSI/ACCT 03-2016 Challenge Courses and Canopy/Zip Line Tours Standards, are designed to establish a minimum Essential Eligibility Criteria (EEC) for practitioners such as guides, facilitators, and other challenge course staff. A prudent operator would consider adopting these, or similar EEC. For more information on the Americans with Disabilities Act, here is a link to an FAQ booklet for employers.